To prevent frozen and burst pipes, insulate any exposed pipes with insulation tape, newspapers, towels or blankets. Keep a trickle of water flowing from an indoor faucet can help keep pipes from freezing during a cold spell. Don't waste the water; save it and use it for other purposes. Turn your house valve off to prevent further damage if your pipes have burst inside your home. Then, make repairs yourself or call a plumber. 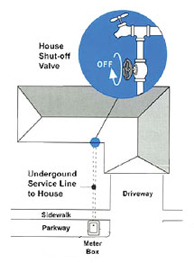 The house shut-off valve is usually located at the base of the hose bib at the front of your house. The valve turns clockwise to close.